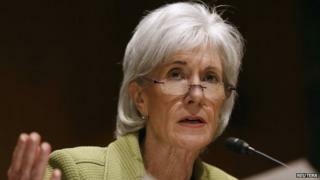 US Health Secretary Kathleen Sebelius is resigning following the problematic launch of President Barack Obama's healthcare law, US media report. The law - regarded by the president's supporters as one of his main domestic achievements - has been marked by early technical problems and delays. Ms Sebelius has been health secretary since Mr Obama took office in 2009. The reports say Mr Obama will nominate Sylvia Mathews Burwell, the current budget director, to replace her. Ms Sebelius had made the decision to resign herself, the New York Times reported. The US president had resisted calls for the health secretary to stand down after the websites where people could enrol for health insurance ran into problems last October. After the rocky start, the White House now points to the more than seven million people who have signed-up for coverage on federal and state-run marketplaces sites created by the Affordable Care Act. Mr Obama says the programme was "here to stay". Republicans see it as inappropriate government intrusion into the healthcare industry. US residents face a tax penalty next year if they do not have some form of health coverage. The 2010 law is intended to extend health insurance to the roughly 48 million Americans who do not receive it through their employers, the government, or a privately purchased plan. It also aims to slow the growth in the cost of healthcare and requires private plans to meet a certain level of coverage. Analysts say Republicans in Congress may use Ms Burwell's nomination proceedings to focus on criticism of the law ahead of November's midterm elections. The law remains controversial among the American public, as some people have seen their insurance costs rise or their old plans cancelled, and others object to having to purchase insurance at all. Obamacare: Has Trump managed to kill off Affordable Care Act?